John Barrow (1764-1848; later Sir John) travelled to China from 1792 to 1794 as part of the first British Embassy expedition. 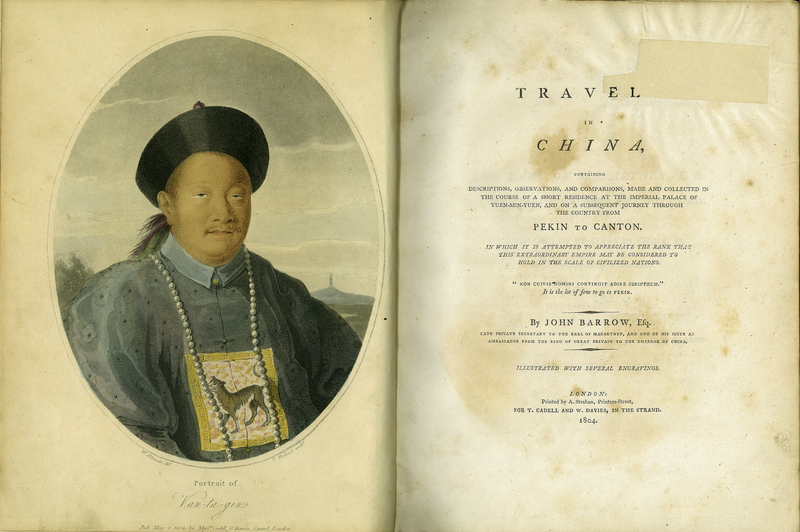 Not only does his Travels to China (1804) recount an early Western visit to that country, but it is also the first book on China to be illustrated by aquatint, a process that gives tonal effects to an image, like a wash of watercolour. William Alexander, also a member of the expedition, drew the portrait of ‘Van-ta-gin’ that forms this very colourful frontispiece. It was engraved by Thomas Medland (c.1765–1833), who also executed the other four aquatint illustrations in the book. John Barrow, “Travels in China,” ourheritage.ac.nz | OUR Heritage, accessed April 26, 2019, http://ourheritage.ac.nz/items/show/10667.